In line with the Illuminati goal for Hillary to be our next president, when you walk into Portland’s enormous Powell’s book store, her book is prominently displayed. Her book may be having an unexpected side effect, for it admits that the United States is behind the creation of the Islamic State group (f.k.a. ISIS, the Islamic State of Iraq & Syria). You will note that arms that American sent to Syria for over a decade were what armed ISIS to start with. This post is a quick view of how alternative views of events are spreading. Some quotes from a BBC article and another article on the Dragon families will be employed for this. Some Americans may be too preoccupied with their expensive toys to notice the U.S.’s hanky-panky worldwide & how so many in the world are noticing such things. People in many countries are aware of how Pakistan’s U.S. backed govt. created the Taliban which got funded by Saudi Arabia & the U.S. The Taliban was created to counter the Soviet power in central Asia during the Illuminati’s manufactured Cold War. So one Hegelian dialectic is used to move us into the next one, just as WW 2 created the dynamics for the Cold War & the Vietnam War. People worldwide are turning from the mainstream press’ explanations…so they are open to hear Turkish president Recep Tayyip Erdoğan say French security forces knew of the Charlie Hebdo attacks ahead of time. This makes the Hebdo attack a false flag on par with 9-11, where the hand of Israel can be seen along with the deliberate allowance of the attacks by Western intelligence. As Islamic State (IS) militants advanced into Lebanon last week - spreading terror into the village of Arsal, bordering Syria, and driving hundreds out of their homes - whispers pinned the blame for their actions on the US. Horrific videos of IS atrocities against Lebanese Armed Forces circulated on the internet. So did the theory that America is behind the existence and emboldening of the group. To back up their claim, conspiracy theorists online pointed to a powerful piece of "proof": the word of Hillary Clinton - the former US secretary of state widely expected to make a bid for the presidency. Screenshots of supposed "excerpts" from her book spread far and wide on social media in Lebanon, claiming the US created IS to instill instability in the region for American gain. The rumor even prompted the Lebanese foreign ministry to summon US Ambassador to Lebanon David Hale. The Dragon Family, which is a group of several wealthy and secretive Asian families, has executed an elaborate sting operation where a vast international alliance of 117 countries now has a legal way to end the financial tyranny of the Old World Order. A lawsuit was filed on November 23, 2011, in the United States District Court for the Southern District of New York which could end the secret government that has ruled Western civilization for at least the past 300 years. The lawsuit was filed by Neil Keenan, acting as representative of the Dragon family. This filing is the result of extensive evidence gathering by international police and law-enforcement agencies including Interpol, the CIA, the Japanese Security Police, Eastern European secret services and has the backing of the Pentagon as well as the armed forces of Russia and China. The lawsuit claims that close to $1 trillion was stolen by, among others, UN Secretary General Ban Ki Moon and the UN, former Italian Prime Minister Silvio Berlusconi and the Italian government, Giancarlo Bruno and the Davos World Economic forum and others believed to include many of the owners of the US Federal Reserve Board. This is a civil claim arising out of the concerted, knowing, malicious scheme and international conspiracy engaged in by the Defendants for the designed purpose of defrauding plaintiff Keenan, the designated Agent of his Principal, the "Dragon Family," for the express purpose of expropriating, stealing and converting certain negotiable financial instruments lawfully owned by the Dragon Family and entrusted to Keenan in early 2009. The ultimate defendants in this legal action are believed to be the same cabal behind the assassination of US President John F. Kennedy and many other major international crimes. This particular lawsuit was triggered by the illegal detainment of two Japanese citizens, Akihiko Yamaguchi and Mitsuyoshi Watanabe, as well as the seizure of $134.5 billion in bonds they were holding in Italy on June 3, 2009. The roots of this case go back to between 1927 and 1938, when, under arrangements made between T.V. Soong (Finance Minister of China) and Henry Morgethau, Secretary of the Treasury, the United States Government purchased some 50 million ounces of silver and leased vast amounts of gold from the Nationalist Chinese Government, known as Kuomintang. For all the treasure handed in, certificates were given to those who surrendered their precious metals. Many of the bonds seized are backed with the Chinese gold taken by the Federal Reserve Board during those years and never returned to its legal owners. …The first shipment of gold they were supposed to give back was due to be sent back on September 12th, 2001. And of course, as you know, the World Trade Center got blown up on September 11th. The gold that was in the basement went missing. Cantor Fitzgerald Securities, the company that was handling the paperwork, was blown up [658 employees, which represented nearly 70 percent of its workforce, were in the office that morning — none made it out alive]. Building 7, where the Treasury police and all these people were, was blown up — and all the paperwork there was blown up. 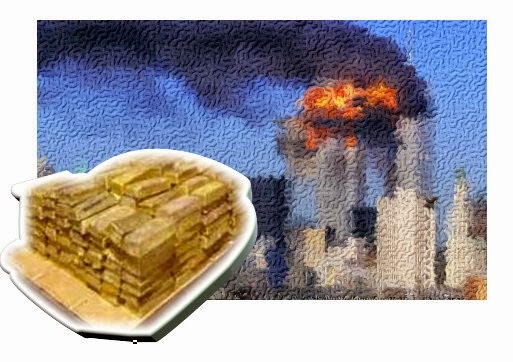 Basically, they were saying, “We’re not giving back the gold!” There was this massive gold cache underneath the World Trade Center, and they snuck it out — it was shipped to California and then I believe to Paraguay. Here again we have a faction, the Dragon families, standing up against the Illuminati. But we should bear in mind that the rise of China’s economic growth and its current success is connected to the Illuminati, so it raises the question…what independent power do these Dragon families actually have to genuinely challenge the World Power?? or are we seeing the growth of some more manipulated conflict that will be deflected to make the World Power stronger?? Will the rise of awareness help mankind, or will it be manipulated and deflected into negative endeavors, and more bloody wars?